Union City Lions Club members who had perfect attendance during the 2017-18 Lions year were honored Tuesday. 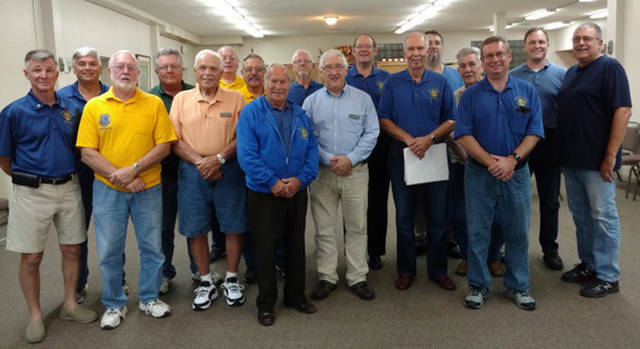 Pictured are (front row, l-r) Larry Amspaugh, Mick Carpenter, Larry Applegate, George Green, David Lenkensdofer, Owen Griffith, Joe Wyant, (back row, l-r) Dan Green, Gary Miller, Doug LeMaster, Jack Anderson, Troy Rose, Sam Davenport, Ed Speight, Harold (Hoddy) Speight, Blake Clevenger and Kevin Lehman. UNION CITY, Ind. – The Union City Lions started Tuesday’s meeting with a meal prepared by D’s Restaurant in Union City, Indiana. The members enjoyed chicken, mac and cheese, green beans, mixed fruit and a roll. Among the items on the agenda for this meeting was to honor the club members who had perfect attendance last year.